We got a chance to play Prison Architect's new 'Escape Mode' with Introversion Software co-founders Chris Delay and Mark Morris on this week's PC Gamer Show, and I was impressed with how much it flips the game on its head. After being a building game for 36 months of early access, Escape Mode lets you take control of individual characters, fire guns, and personally do everything else you've only been able to view at a distance until now. Watch the video above to see Delay give us a hands-on look at the chaos that can ensue. 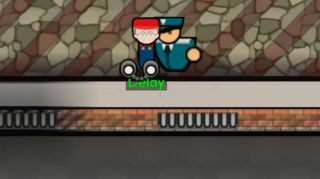 Prison Architect will be leaving early access, along with Escape Mode, on October 6th. The PC Gamer Show is our weekly livestreamed podcast. You can catch the show live on Tuesdays at 1 PM PDT on our Twitch channel, or and the archive of past episodes right here.